This is looking back towards the Main Gate from inside the garden. 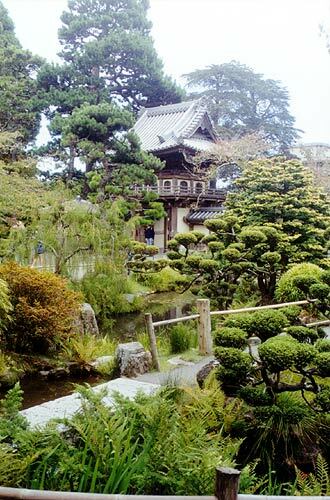 The four acre garden is the oldest public Japanese garden in California and is a descendant of the 1894 California Mid-Winter Exposition held in the Golden Gate Park. The site was originally a Japanese Village, but Baron Makoto Hagiwara and his family, over many years, turned it into this beautiful garden. As you can see, the vegetation is very lush and green. Many of the small trees had been cut into the unusual bulbous forms in a style of Japanese topiary that seemed to be popular. We even saw this sort of thing in some private gardens. We didn't stop at the tea house, but spent our time just wandering along the many paths. The garden is a delight to explore.